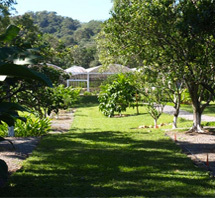 Welcome to Blue Harbor Tropical Arboretum, Roatan’s working ”Tropical Eden” covering over 160 eco-friendly acres. Our location offers gorgeous tropical botanical gardens and fruit orchards for you to explore, plus amazing local nature and stunning ocean vistas from our hiking trails. Come see our extensive grounds that highlight the best of Roatan’s natural beauty and splendor. Our tours include guided tours of our botanical gardens, conservatory and fruit orchards, nature hiking, bird watching, and even a mud run and obstacle course for more active travelers. 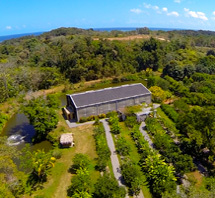 With our tropical gardens and miles of walking trails maintained year-round for guests and locals to enjoy, Blue Harbor Tropical Arboretum provides a safe and stunning location to appreciate the natural wonders of Roatan. A visit to Blue Harbor Tropical Arboretum should include a tour of our hydroponic farm, which is leading the way in water conservation and sustainable farming practices. We believe that hydroponic farming is the future for safer, fresher, longer-lasting produce in your kitchen. Because of our eco-friendly focus we use no pesticides on our produce and herbs, and we are very sensitive to our use of the island’s resources. If your cruise ship stops in at either the Port of Roatan in Coxen Hole or at Mahogany Bay, you can take advantage of the beauty and convenience of Blue Harbor Tropical Arboretum. We offer shuttle service to pick you up and drop you back off at your port in a timely manner, making your visit a convenient and enjoyable shore excursion. Whether you want a relaxing day exploring our botanical gardens or an active day hiking through the gorgeous tropical jungle, visit Blue Harbor Tropical Arboretum for a day of outdoor fun with your family and friends. Plan your visit today! Blue Harbor Tropical Arboretum is currently closed for maintenance, check back here for more details on new opening times over the next few months. Find out more about our tours! Ideal location for weddings and special occasions. We are planting the future and recalling Roatan’s heritage. To share the art, enjoyment and knowledge of tropical horticulture with an eco-friendly sensitivity that improves our natural resources while providing for education and research using sustainable agricultural methodologies. The Arboretum has something for everyone in every season. We will leave the land better than we found it, for generations to enjoy. 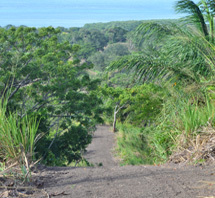 You are invited to Explore and Enjoy the tropical nature of Roatan. Visit us Today! We thank you for understanding and appreciate your interest in Blue Harbor Tropical Arboretum.